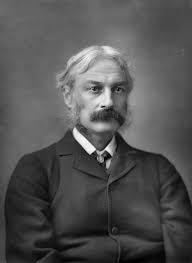 Andrew Lang grew up in Selkirk in the Scottish Borders. He studied at St Andrews University and Baliol College, Oxford. He worked in London as a journalist, fora long time Longman's Literary Editor. He is perhaps best known for his twelve ‘Fairy Books’ which were a collaboration with his wife. He collected recorded stories from Britain and abroad, countering the prevalent belief that fairy stories were bad for children. He also wrote novels, literary criticism, articles and poetry including A Short History of Scotland. His last book Highways and Byways of the Border was unfinished at his death and was completed by his wife. He is buried within the precincts of St Andrews Cathedral. Before Barrie asked ‘Do you believe in fairies?’ Andrew Lang was banging their drum. But even if you don’t clap your hands at Peter Pan’s request, there’s plenty more to explore in the work of Andrew Lang. His interests were folklore, myth, religion and anthropology. His work collecting fairy stories from around the world and putting them into books distinguished by colours – not just primary colours but exotic ones like lilac too – made him popular with both parents and children alike at a time when children’s literature was an emerging form. So if you are interested in folklore and fable, fairies and myth, Lang is a man not to be missed. These, it seems, were Lang’s own obsessions and his work is nothing if not thorough and comprehensive. Beyond fairies, as a critic at a time of great change in the literary and cultural world – the first attempt to democratise literature perhaps – Lang was solidly established within the elite. So never mind a belief in fairies, with Lang I find myself exploring the question ‘Do you believe in literary criticism?’ There’s plenty in his writing to fuel the quest. He writes at length (well, it is the 19th century) on the subject. He gives masses of advice to authors and readers and it all feels just a little bit proscriptive. There are universal truths contained within the writing, things that are still worthy of consideration, but they are mediated with his own, perhaps inevitably prejudiced, perspective. To engage with Lang, one can do worse than spend just under a fiver on the Delphi Complete Andrew Lang. HERE I’m working my way through it (bypassing the fairies) in an eclectic manner. How to Fail in Literature is less funny than it probably was in its own day. But it still contains some universal truths. Adventures Among Books and The Library and Letters in Literature are other essays and collections I’ve read thus far. Reading his novels requires an investment of time I just don’t have right now, so I stuck to the short form. I can recommend reading some Lang perhaps less to broaden the mind than to gain an insight into how life was in the 19th century as publishing was experiencing the birth pangs of democratisation, on the cusp of the mass ‘popular’ revolution of the late 19th century. Read Lang as a guide to a moment in time – especially if you are interested in the history of publishing in UK, including periodical publishing. Or read him for the fairies. The choice is yours. Lang is certainly an eminently quotable writer. “In literature, as in love, one can only speak for himself,” is a fine sentiment, all too often forgotten in the modern world. However, his friend and biographer Edmund Gosse suggested that Lang was somewhat more blinkered in his own reading and critical faculties. If he didn’t like something he more or less denied both its validity and its existence. On my reading thus far, Lang proves to me not the existence of fairies or literary criticism as an art-form, but more that it’s true that ‘the past is a different country.’ I haven’t even touched on his historical writing though he wrote A Short History of Scotland and books on Knox and many other historic and cultural figures. I know I’ve just scratched the surface here and so I won’t make any definitive claims about the man or his work. I like to remember that the man (or woman) author is never synonymous with (often not even reflective of) their written words. Lang isn’t the sort of writer who would gain fans these days, but his writing does offer a great insight into the times in which he lived and worked. And for that alone it’s well worth engaging with.